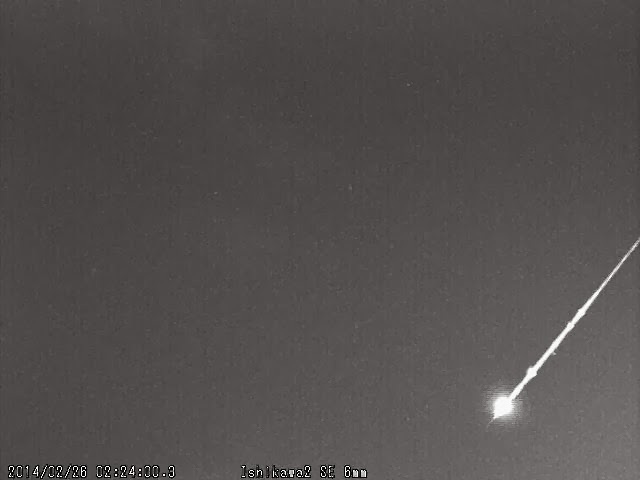 Breaking News - Kenya Bolide Meteor With Loud Boom 27FEB2014 - SONICS! 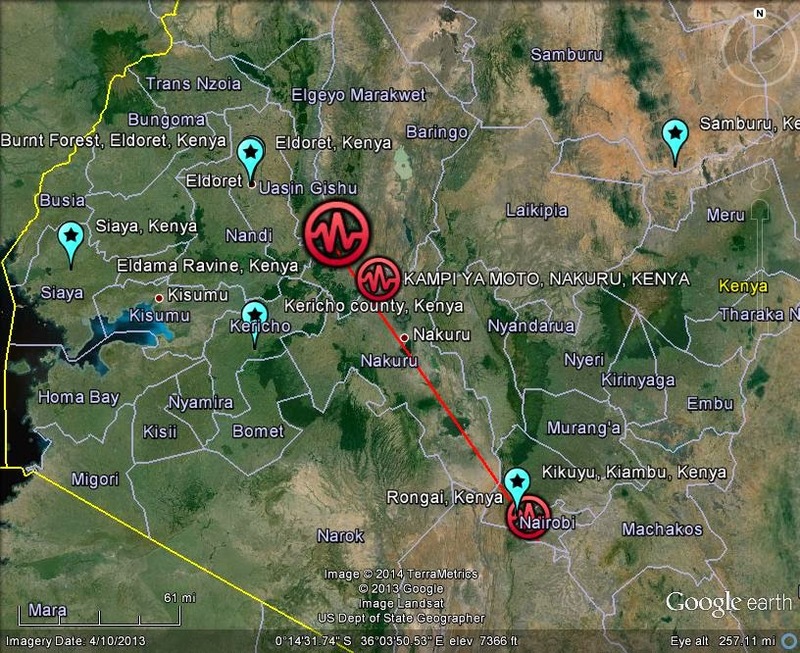 UPDATE- Sonic reports by witnesses put the most likely area for the fall to have occurred near the areas of Eldama Ravine, Kenya and Kampi Ya Moto, Nakuru, Kenya; the more likely of the two being nearest the Eldama Ravine, Kenya area. With the sonic report also at Ronga it is not impossible that there was more than one body traveling in this event or multiple breakups of the same body. Detected by MBIQ "Meteor Bot Internet Query" Bot, an AI application using both artificial and human intelligence. http://lunarmeteoritehunters.blogspot.jp/2000/11/meteor-fireball-report-form.htmlPlease help get the word about this event so that we might recover security camera video or cell phone captures; spread the word about this website via Facebook, Twitter, YouTube, Reddit, GLP, SOTT and your favorite forums; contact your local news outlets; thank you! 27FEB2014 Gerald Eldama Ravine, Kenya 20.10 pm Over 30 seconds not clear Loud explosions 10 times louder than thunder Super bright not clear Multiple witness reports. A super bright light that lasted for a span of 30 seconds was spotted in the sky at about 8:10pm today. It was later followed by a deafening bang around Torongo and Poror areas of Eldama Ravine. Many who did not manage to see the bright light though heard the sound believed it was an explosion. The light was seen by many as far as Marigat and Eldoret. 27FEB2014 Tony Karomo Burnt Forest, Eldoret, Kenya 2000 26SECS N-W;S-E BLUE, BRIGHT BALL, ORANGE TAIL BLINDING WHITE-BLUE SMOOTH EDGES, NO FALLING PARTS LOUD BOOM HEARD, ESTIMATION 50KILOMETRES AWAY. --I spotted the Fireball on thursday, 27th february night, around 7:50pm. it had a bright, blinding blue light and an orange tail, then later a boom. What exploded over the Rift Valley on Thursday night? Kenya arrived on "Latest Worldwide Meteor/Meteorite News". Kenya arrived from google.com on "Latest Worldwide Meteor/Meteorite News". Nairobi, Nairobi Area arrived from google.com on "Latest Worldwide Meteor/Meteorite News". 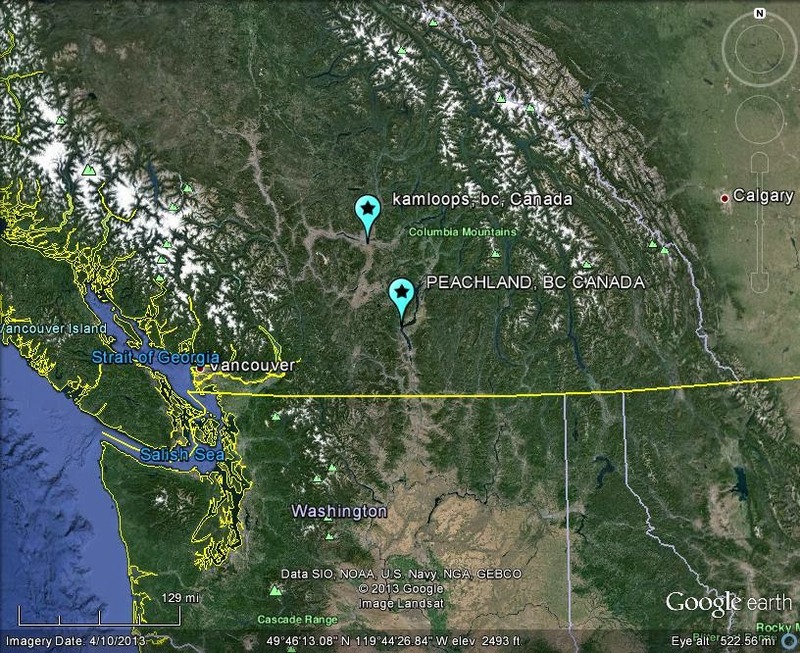 Kenya arrived from thelatestworldwidemeteorreports.blogspot.com on "Latest Worldwide Meteor/Meteorite News". Nairobi, Nairobi Area arrived from google.com on "Latest Worldwide Meteor/Meteorite News: Breaking News - VA NC PA Fireball Meteor Widely Seen 27FEB2014". Mombasa, Coast arrived from google.com on "Latest Worldwide Meteor/Meteorite News: The Latest Worldwide Meteor/Meteorite News 27FEB2014". Nairobi, Nairobi Area left via 4.bp.blogspot.com from "Latest Worldwide Meteor/Meteorite News"
Posted by Lunar Meteorite * Hunter at 5:38 pm Labels: Breaking News, Eldama Ravine, Eldoret, Kenya, kenya meteor, Kenya Meteor/s 27FEB2014, loud boom, Marigat, SONICS! -- Another repeated night of activity in FEMA Regions III and IV! 27FEB2014 David Stakston Holmen,Wisconsin,USA 2352 CT PM 1-2 sec E-W Looking out west facing window Bright streak which extinguished just above the horizon The trail left by the meteorite was very bright no When it appeared in my window facing west it left a bright streak until the meteorite burned up above the horizon. 27FEB2014 Shannon Jones powhatan, va, usa 19:30 est max 3sec it fell straight down white very big/close like high beams on a car no it was shaped like a cone or triangle with the point down. 27FEB2014 T Griffith Claremont, NC, USA 7:20:00 5-10 sec N-E, Left to right Long Tail orangish in color, bright center same as sun looked like sparkles on each side that disipated Appeared to be right above tree line before disappearing. I was in awe, then realized how close it was coming toward the ground. It just kept going, before finally burning out. 27FEB2014 J Powell Cale Charles, VA, USA 7:18 pm / EST 3 seconds Low on horizon / East to West over Chesapeake Bay Green / No Sound Brightness of the moon No fragmentation / Short tail Made me slam on my truck brakes. Looked close! 27FEB2014 Samuel Perks Caroline County, VA, USA Approximately 7:15 EST Around 3 seconds. E-W Bright blue with slight orange at back of tail. Brighter than a star. No visible fragmentation. Started to dim but got brighter before fading completely. 27FEB2014 Rebecca ROUGEMONT, NC, USA 1912/EST,PM 2-3 sec NNE GREEN Muted it looked like it burned almost out and then picked up and burned again. Perhaps two parts? probably 3rd largest I ever saw and it seemed to be falling down, not across the sky. 27FEB2014 WV Man Oak Hill, West Virginia, USA 19:10:00 3 seconds Facing East, small fireball seen traveling N-Sish appeared to be falling at an 80 degree angle. I was in my car, but it was a white and green fire ball smaller than the moon yes Please let me know if any further information is received. 27FEB2014 Amy Umberger Locust Grove, VA 1910 PM EST 10 seconds E-W bright white with lots of sparks as bright as the moon sparks in the back It was a BIG, bright fireball with lots of sparks. Very impressive! 27FEB2014 Steve Richmond,va 1908 eastern daylight savings 3 to 5 sec Facing southwest it appeared to. Down toward earth Green with tail Very bright in a clear sky Yes, it appeared to fragment then disappear Very visible in clear winter sky. Scientists at NASA's Johnson Space Center in Houston and JPL have found evidence of past water movement throughout a Martian meteorite, reviving debate over life on Mars. BLUEBERRIES on Mars and Mickey Mouse on Mercury have been spotted in space. But they’re not alone. What other oddities have been found? .. Details It was another frigid night, in a city where one would think a glimpse of warmth on the horizon would be embraced by those weary of this winter's stubborn grasp. But what one veteran officer witnessed – while most were tucked away in their beds - was not a sign of spring. In fact, he initially feared there might be casualties. The officer was parked near Westgate Mall's Hy-Vee store when suddenly, just before midnight, a "large bright white fireball" pierced the cold night sky. "The object was moving extremely fast and would have without question struck the ground." That is what the officer initially thought. A colleague confirmed he had just witnessed the same "long fire trail" as he drove his squad car along Old Sauk Rd. The initial officer was able to capture the moment on squad car video. Looking at it, it did appear the object could have fallen near a local television tower. The officer drove there and could find nothing out of the ordinary. He checked, and the FAA reported no large planes in the area. No longer fearing a catastrophic event, the officer took a few moments to further process what he had seen, and as he did, he began to believe whatever fell from the sky could have tumbled a long, long distance away. "I did not see any impact flash or hear an impact," he concluded. In the end, he thought it likely a meteor or some space junk that momentarily heated up an otherwise cold night of routine patrol. "The chance of a koala being hit by a stray shot - remembering it is a big area - is not as great as a koala being hit by a meteorite," Mr Jones said. Meteorite May Harbor Evidence of Mars Life. White L. M., E. K. Gibson, K. L. Thomas-Keprta S. J.
Yamato 000593. Astrobiology. vol. 14, no. 2, pp. 170-181. The Draconide Meteor Shower 2011 was accompanid by a multi-color Aurora Borealis. These images are from Stavsro in Telemark - Norway. 25FEB2014 John Rice Abbortsford, WI, USA 0212 CST 1.5 sec W-E, Right to Left, East Bluish center and yellow in color on the outer edge, no sound Bright as the full moon There were parts trailing the main coma Was traveling in a vehicle at the time of the event. This image is one frame from a collage of radar images taken on Feb.
times farther from Earth than the moon is. Have signs of ancient Martian life been found inside a Red Planet meteorite? Martian "Blueberries" Really Pieces of Meteorites? The Arlington II rock, as their find has been dubbed, likely is 4.6 billion years old and hailed from the main meteor belt on the other side of Mars. How about track down a piece of a meteor (especially tough if you're nowhere near Russia), or change the top names of 2013 (because, really, Liam? 23FEB2014 Jake Yutzy Denver, CO 18:25 PM MTN 4-6 seconds N to NNE 12 o'clock to 1 o'clock 12 being due north orange and white fireball brightest thing in cloudy sky none seen I was driving NE and it was bright enough to get my attention to the north. I had time to look at it, for a couple seconds, look at the road and look back at it to see the firebell go out. 23FEB2014 Don Longmont, CO,USA 1812 5 seconds From SW toward NE Bright white in color, went out side to see if any sound could be heard, but no sound occurred Much brighter than the landing lights on passenger jet descending from 12000 feet into Denver, which passed by about 20 seconds after the metior passed Object dividend into at least two pieces, and became larger in size as the fragments burned up about 1 or 2 seconds later First observed at when looking due N. at about 45 deg above the horizon, and burned out at about 30 degrees above the horizon while looking at about a 030 heading. 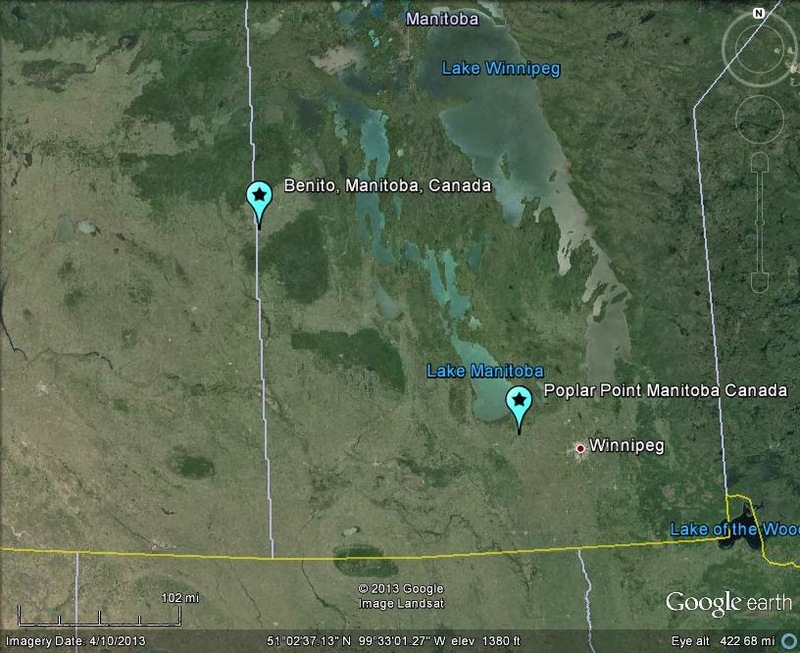 24FEB2014 cindy johnstone Benito, Manitoba, Canada 1855,CST, PM 7seconds West-East I was travelling north it had green red and yellow and was streaking across the sky at a downward angle at first thought a crashing plane and then it disappeared sun then faded to nothing no first thought something crashing because of the colors. Several witnesses across Vermont, northern New York and southern Quebec took to the American Meteor Society's website to report the incident. Initial Meteor Sighting Reports- 22FEB2014 erick a copiague ny united states 10:13:00 it was in the sky and in my sight for about 20 seconds then i .
Astronomers call a very bright meteor a "fireball." It is a piece of space debris that enters Earth's atmosphere and burns up due to friction with the air. An Earth-based observatory has published video footage of a 400 kg meteor ramming into the moon at a speed of 61,000 kilometers per hour. Telescopes in southern Spain have recorded the flash of a meteorite that hit the Earth's moon with a force equivalent to 15 tonnes of TNT. QMI_F2_large_24_02_2014T162035 A satellite image of the flash created when a record-breaking 400-kg meteor crashed into the moon on Sept.
Biggest Observed Meteorite Impact' Hits Moon..24 FEBRUARY 2014 Scientists say they have observed a record-breaking impact on the Moon. 24FEB2014 becca elkton, maryland, us 920 pm 15 sec west orange fire ball with large tail fire not sure would really like to no if it was a meteor or what it was? 24FEB2014 Daniel Boon Brewster,ny. USA 21:15:00 30 Over head/ south facing south White/Blueish Venus/ got bright,then faded Could not tell Longest I've ever seen, got nervous. 24FEB2014 Joe M. Warwick, RI 21:15:00 4 United States white Bright as moon No Pretty Bright! A space rock impacted the surface of the moon on September 11, 2013 with explosive force of 15 tons of tnt. It was estimated to be between 1.9 and 4 feet wide, 880 lbs (400kg) and traveling at ~38,000mph (61,000 km/h). For All of Paul V. Heinrich's "The e-Pistles of Paul ©2010-2014 A.D."
It is currently an open access paper. 28 structures judged not to be of impact origin. Posted by Lunar Meteorite * Hunter at 6:15 pm Labels: 2014, aul V. Heinrich, C. Koeberl, Impact structures in Africa, Journal of African Earth Sciences, Reimold, W. U. 23FEB2014 michael rukavina burlington, ontario, canada 21:00:00 1 second Travelling straight down; was facing NW sky White light. No sound. Just bright light travelling straight to ground likely several miles to NW. Like a firework dropping to earth. Did not see it break apart. It is quite cold otherwise (aside from no sound) would have assumed this was a firework dropping. However, dropped quickly. "meteor i've seen in quite some time. To put it mildly, this is one gem of a gem. Sri Lanka Meteorite Hits Roof 17FEB2014 ??? ?